Are you taking advantage of the tools Ancestry DNA has provided to discover and track your cousin matches? If not, read on and discover three tools on the website that are often overlooked and can greatly aid your DNA research. To illustrate I’m using my first cousin’s DNA match (with permission) to show you how effective and easy this can be. The screenshot below shows the information displayed on my cousin match page. Notice that I have clicked on the star to turn it gold, signalling it as a “favorite.” For me this means that I’ve previously looked at this match and figured out the relationship. That is my criteria for a “favorite” match. You can decide for yourself what criteria to use in turning a star gold. What is missing on this page is a way to quickly remind myself of my connection with my DNA match. With several hundred matches, I need an easy way to do this. Ancestry DNA provides a tool just for this purpose, but first you have to find it. When you click on the green “view match” icon, you are taken to a page giving you more information, shown in the screenshot below. 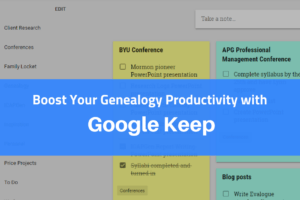 Did you realize that by simply clicking on the blue “Add note” icon, you can write a reminder of the important details you’ve figured out such as this cousin’s identity, your shared ancestors, shared surnames, etc. ? Once you click on the blue “Add note” a message box opens up. You can use up to 500 characters to enter information about a particular DNA match. This message will only show up on your Ancestry DNA page. In this example below, I know the the name of my cousin and our shared ancestors so I simply type that in. 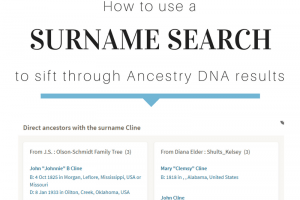 If I didn’t know the connection, I could put other information such as ” shared surnames include Shults and Royston,” signalling a match on my paternal side. I could include contact information, dates when we corresponded, or anything else that would help in my DNA research. Why is this so helpful? Now when I look at my DNA results page, the note icon now appears next to my cousin’s DNA user name letting me know that I’ve entered some information about this match. 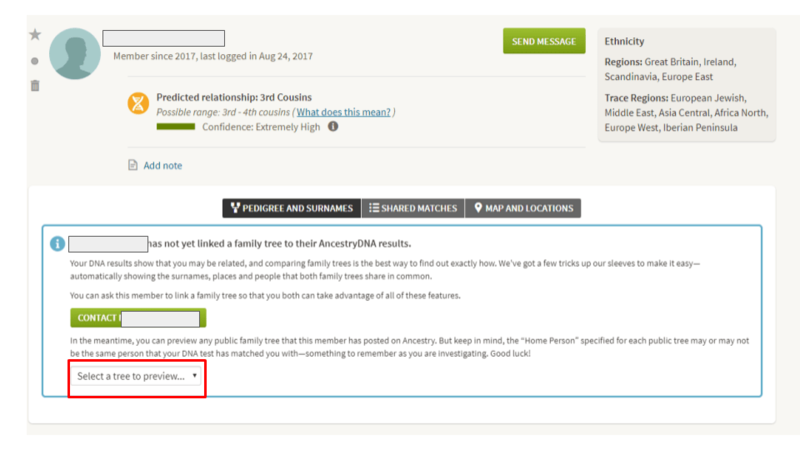 When I click on the icon, my message opens up, right on my DNA results page. I can quickly go down my list of DNA matches, clicking on each note icon to view my connections. This saves a great deal of time and effort. 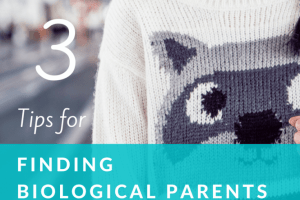 How can you sort out the matches between your maternal and paternal lines? What if you just want to find matches just for a specific great grandfather’s line? 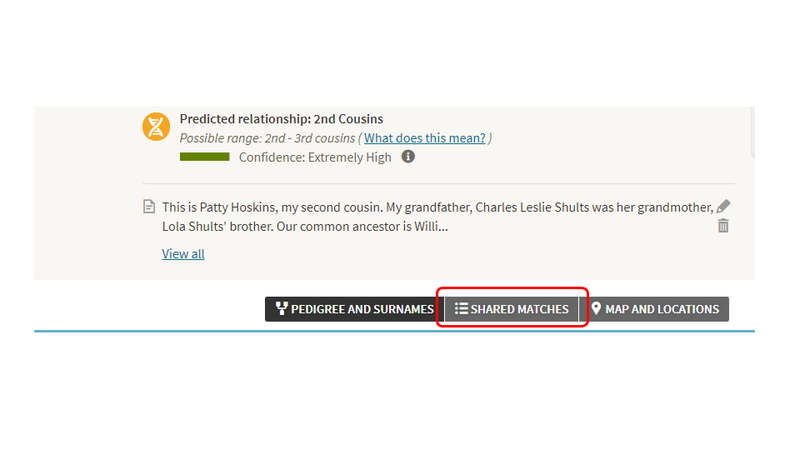 Using the “shared matches” tool on Ancestry DNA you can do just that. I’ll use my DNA match, Patty, to illustrate. I discovered Patty through DNA and met her earlier this year. My article “3 Tips for Connecting with your DNA Cousins” details that amazing experience. We share great grandparents William Huston Shults and Dora Algie Royston. Because I wrote a note detailing this DNA match, I can quickly find Patty again. 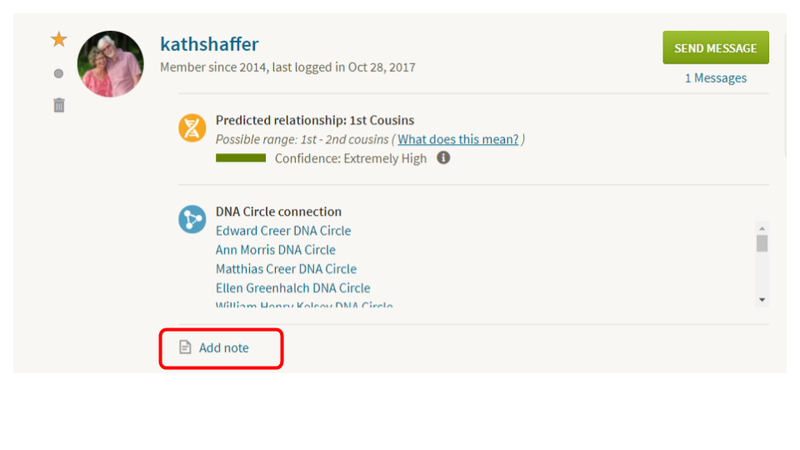 The screenshot below shows her page once I’ve click on “view match.” I want to quickly find other matches on the Shults/Royston line, so I’m going to use the “shared matches” feature of Ancestry DNA, highlighted in red. Clicking on “Shared matches” brings up a list of 3rd cousins who share DNA with both Patty and me. 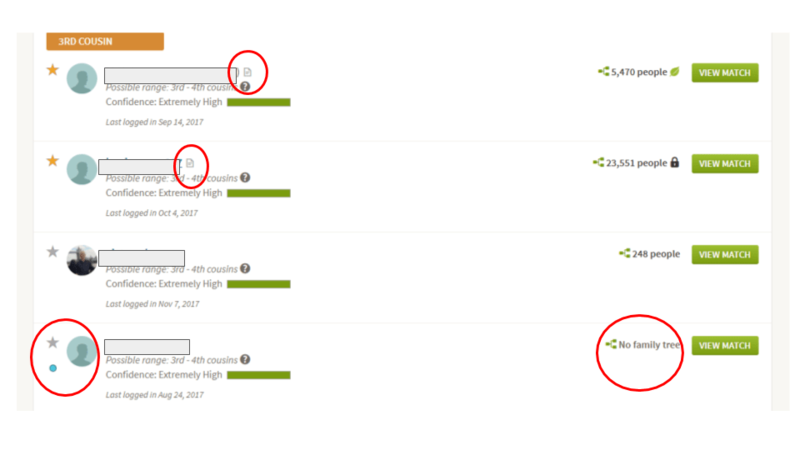 Notice that the top two matches have a gold star meaning I’ve looked at them and figured out the connection. They also have the note icon so clicking on that reminds me immediately of our shared ancestor or surname. The bottom two matches do not have notes attached yet, but because they share DNA with both Patty and me, they are most likely on the Shults/Royston line. With that information, I can send a message explaining our possible match. I can also add a note to this match with the information I discovered from the shared match feature. Notice that the very last match also has no family tree attached. It might seem that there’s no way to determine my relationship to this 3rd cousin. But because I’ve narrowed down the playing field with shared matches I can start to figure this out. It may seem impossible to figure out the last match because there is no family tree attached. But when I view the match, I see that this DNA cousin actually has a tree to preview, it just isn’t linked to his DNA. Although the tree only has six names, I immediately recognize a surname and because I know that this DNA match belongs to my Shults/Royston line, I’m fairly certain of the connection. This individual is the descendent of my great grandfather’s sister, Henderson Elizabeth Shults. Now I can send him a message and confirm the relationship. How will I record our connection? I’ll add a note of course! Best of luck in your DNA adventures! Any successes? Share your story in the comment section. I added a chrome extension called MedBetterDNA so that I don’t have to click on the note icon to see what it says. The full content of the note is visible as I scan my list of matches. Too bad Ancestry couldn’t have done that. Since you told me about these features, I use them all the time. The shared match tool worked well for me to isolate my paternal side of the tree. Great! I’m glad it has worked well for you. I would love to see some different tags than the star so that we could quickly identify which line a match is on! Something for Paternal Line, Male and female, Something for Maternal line male and female! So a total of 6 different tags and all should be visible on the profile if a person has used them! I agree, more options and flexibility would be lovely for tagging the results. We can always hope that new tools will eventually be introduced!